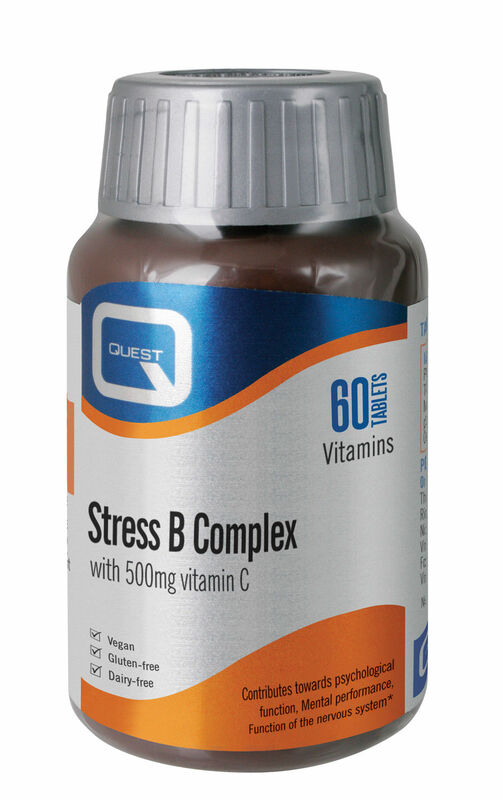 Quest Stress B Complex is a quick acting medium potency formula providing a full spectrum of the B vitamins plus vitamin C to support energy levels, the nervous system and psychological function. Vitamins B1, niacin (B3), B6, B12, biotin and vitamin C contribute to normal functioning of the nervous system and normal psychological function. Vitamins B1, B2, niacin (B3), B6, pantothenic acid and vitamin C contribute to the reduction of tiredness and fatigue. Vitamin C (with hydroxypropylmethylcellulose), Bulking Agent: Microcrystalline Cellulose, Pantothenic Acid, Riboflavin, Niacin (as niacinamide), Choline Bitartrate, Thiamin (methylcellulose), Para-Aminobenzoic Acid, Inositol, Silicon Dioxide, Vitamin B6 (methylcellulose), Croscarmellose Sodium, Magnesium Stearate, Vitamin B12 (di-calcium phosphate), Biotin (di-calcium phosphate), Folic Acid (di-calcium phosphate), Glazing Agent: Hydroxypropylmethylcellulose.